Posted on Thursday, January 11th, 2018 at 5:30 am. Fresh content keeps loyal readers coming back, and it brings new readers to your site. Check for broken links regularly. Broken links irritate readers. It’s as simple as that! I use a Broken Link Checker plugin to scan my site regularly and make updates as needed. Bonus: Replace old or outdated references with fresh, new links. Then, be sure to tag the folks you’re linking to when you re-share across social! Read more: What is a 404 Error and How Do I Fix It? Swap out the featured photo. Piece-of-cake update: Add new pinnables to old posts. Then, of course, don’t forget to re-pin on all your relevant boards! Use a scheduling tool to share and re-share with new, unique copy. “New, unique copy” is key. Most scheduling tools make it easy to post and repost the same messages over and over. That’s OK to a degree, but craft several different—though equally compelling—social messages so that your audience isn’t getting hit with the same text over and over. Eliminate the ROT: redundant, outdated (or obsolete), and trivial. If a post isn’t getting traffic or if you cringe when you see it in your archives, first try to update it. Can you tighten up the copy? Add a new pinnable? Replace some of the resources with new? If not, let the post go! Build resource pages. Roundup your most useful information by topic to create a resource page that helps your audience navigate your helpful content. Infuse SEO terms, and create images that your audience can’t wait to share! BTW, this is a great way to decrease that bounce rate IF the posts you compile compel your readers to click through. Develop new skills. One constant in the blogging world: change! Keep your content fresh by always learning new skills, picking up fresh tips, and developing some of your own best practices. The Social Learning Community is a great place to start. Never be “finished” with your blogging education! Publish your best work. It’s easy to fall into the trap: “Argh, it’s Thursday. I always post on Thursdays. I have nothing to write. My audience expects a Thursday post. I better go pull something outta thin air.” Those outta-thin-air posts quickly add up and decrease the quality and relevancy of your blog. Before you click publish, ask yourself: If a brand-new, ideal reader were to land on THIS post before any other on my site, would I be proud? Would this post reflect my authenticity and be THE post to turn an ideal reader into a loyal reader? 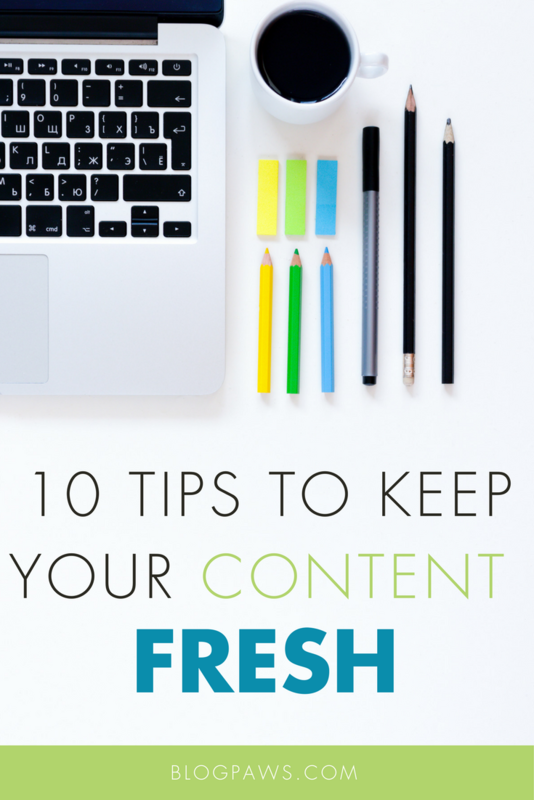 How do you keep your blog’s content fresh and relevant? Which of these 10 are you going to try first? Any tips to add to this list? We’d love to hear ’em in the comments below! Maggie Marton serves as the BlogPaws senior editor. When not hiking with her two pit mixes, Emmett and Cooper, or playing with Newt the Cat, Maggie writes about them (and the pet industry) at ohmydogblog.com and maggiemarton.com.